Located in the Caribbean lowlands and bracketed by the Sarapiquí and Puerto Viejo Rivers, La Selva is covered with what is technically known as tropical pre-montane wet forest and more commonly referred to as rainforest. 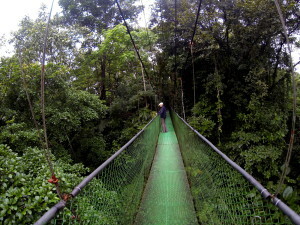 There is no better place in Costa Rica to learn about this ever more endangered ecosystem. Much as Dr. Daniel Janzen was for tropical dry forest conservation two decades later, Dr. Leslie Holdridge could be considered the father of rain forest science in Costa Rica. 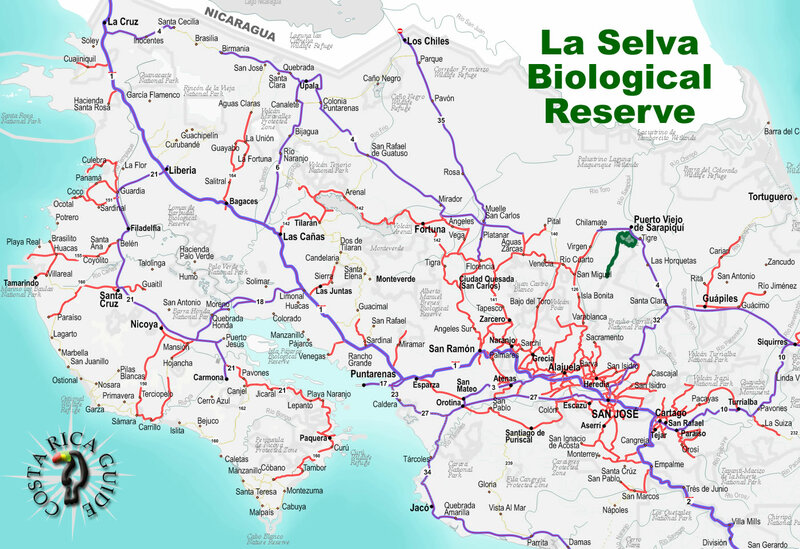 He established La Selva as a study site on mixed plantations for the improvement of natural resources management in 1954. Since its purchase in 1968 by the Organization for Tropical Studies (OTS) it’s been declared a private Biological Reserve and grown into one of the premier sites in the world for research on tropical rain forest. 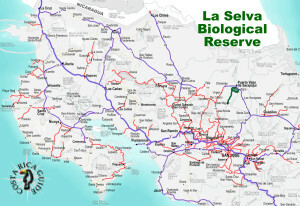 La Selva offers a unique combination of pristine ecology and expert naturalist guides with over 50 km of improved trails (some are wheelchair accessible). You could also choose a more leisurely outing observing nature from the comfort of your seat in a small launch cruising the Río Sarapiquí. All day workshops include classroom and theater presentations, then a chance to put what you’ve learned into action in the field—bird watching 101, nature photography, and scientist for a day. The access and support are unprecedented and if that weren’t enough the folks at OTS invite you to spend the night. The accommodations are comfortable and clean (though not luxurious) and you can take advantage of night walks or the 5:30 a.m. “early bird” avian exploration without worrying about driving in the dark. Some of the original plantations exist, but nearly ¾ of La Selva is covered in some of the most pristine old growth tropical rainforest in Costa Rica. 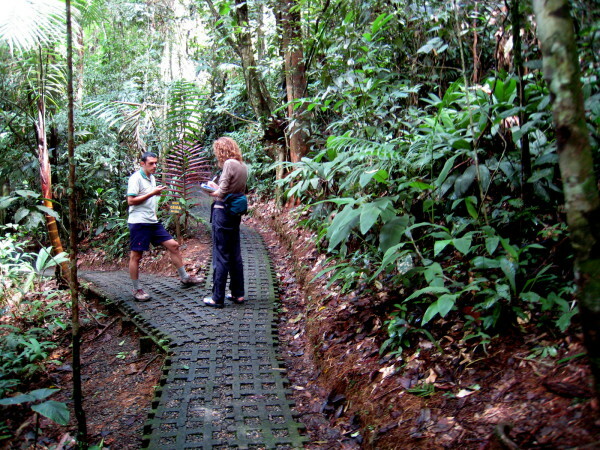 The Leslie Holdridge arboretum now covers one cacao plantation with 254 species of trees from all over the reserve. The ultimate goal is to represent each of the over 400 species known to grow in La Selva (over half of the species that exist in Costa Rica). The trees are tagged for easy identification and guided tours are available. We’ve been visiting Tirimbina Rainforest Reserve for years and it has been slowly growing and improving until now it’s one of the best rainforest experiences in the Northern Lowlands – One of the best in Costa Rica. 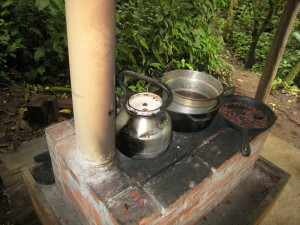 Excellent and extensive trails (clear and level – excellent for night hiking) through the protected rainforest are complimented by simple but really nice rooms at the station and great typical meals in the cantina. The best chocolate in Costa Rica and a presentation on how they make it are available daily in the small plantation of cocoa trees that’s been retained on the south end of the rainforest. It’s about $55 a person per night but that’s really cheap for an All Inclusive in Costa Rica especially since it includes the reserve entrance fee. Do It! The Río Sarapíqui bisects the northern lowlands on the Caribbean slope and in general it’s one of the rainier regions. The rainfall is more constant year round and the dry season is not nearly as dry as on the Nicoya but the rainy season is not nearly as wet as the Osa. Take the Guápiles Highway northeast through Braulio Carrillo National Park for approximately 48 km. Turn left (north) on Route 4 following the sign to Puerto Viejo (the intersection is 7 km after crossing the Río Sucio), and continue for approximately 30 km more. 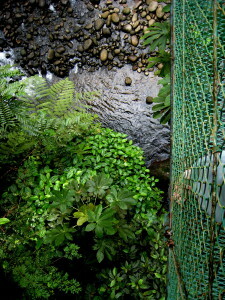 The La Selva entrance is 3 km before (south of) Puerto Viejo de Sarapiquí. Private shuttle service is available by prior arrangement. Public buses from San José to Puerto Viejo de Sarapiquí will drop you at the entrance (1.1 km from the reception office)—Transportes Caribe, 2221-7990 C Central between Av. 13/15, approximately every two hours between 6:30 a.m. and 6 p.m.
Tirimbina is along the west side of the river near La Virgen and the same buses apply.